Arduino remote is an attempt to use relatively cheap HC-12 module, which has plenty of options, ranging from 100 channels, power setting from 0.8 mW up to 100 mW at 433.4 to 437.4 MHz. Out there exist up to 1 W transceivers, but this will come later as long range will be needed, just for sake of simplicity, I will say that 100 mW is more than sufficient for decent range. Datasheet. Why 433 MHz instead 2.4 GHz?! The reason is simple: 2.4 GHz is too much “crowded” with all that WiFi signals and it has more dependence of humidity, obstacles, and other factors. 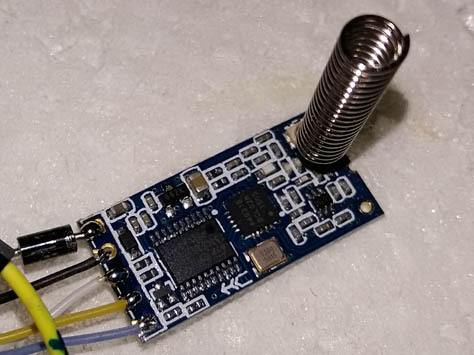 All what is currently present on this band is wireless car keys, humidity and temperature sensors, and maybe other unknown low power transmitters. Note that this frequency as well as 2.4 GHz and 5.8 GHz are under ISM bands. So, no any licence needed, just pay attention of your local regulations. For example, while most of the world accept 100 mW power, in UK is allowed only 1/4 of that: 25 mW maximum. Keep in mind that HC-12 has 100 channels, with 400 kHz spacing, which means that channel 100 will be at 437.400 MHz, well above legal limit of 434.790 MHz (from 433.050 MHz to 433.790 MHz, so only first four channels are “legal” by any means. This “huge” spacings are made because this module can work on really wide modulation on high speeds. But, since we need mostly decent speed, say 15 kbps in air, less than 400 kHz will be more appropriate, but this module just has not this option. Yes, it has few bad things. First at all, this module has no RSSI, so telemetry and feedback about how good signal is at other end is not possible. Only telemetry is possible for battery status, GPS coordinates and various other things, since it is actually transceiver, not simple transmitter or receiver – both modules on remote and your vehicle or any other apparatus (for example, you want to trigger camera by this remote) are capable to send some data back. * any copyright, but no waranty that it will work properly as well, so as-is. //and RX of the HC-12 goes to the TX of the same board! analogReference(EXTERNAL); //not used exactly for displaying status of the local battery. if (mySerial.read() != 79) digitalWrite(13,1);// if first letter is not "O" from HC-12 feedback "OK+B9600"
if (mySerial.read() != 79) digitalWrite(13,1);// if first letter is not "O" from HC-12 feedback "OK+C001"
if (mySerial.read() != 79) digitalWrite(13,1);// if first letter is not "O" from HC-12 feedback "OK+P1"
//Serial.println("Power is 12.6 mW "); //only if P5 is set, your choice. if (mySerial.read() != 79) //digitalWrite(13,1);// if first letter is not "O" from HC-12 feedback "OK+U8N2"
//but so far, it is not implemented. // so change this comments so that fit your needs, for example car or similar. * that 0 is maximum forward, while 1023 is maximum backward. Or vice voersa. //const byte disablePin = 2; //OSMC disable, pull LOW to enable motor controller //removed, because ISR is on pin 2!!! //every time it is on again - has the same parameters, else it may be in error. //ISR routine for "decoding" incoming packets from HC-12 (received from remote). Instead using "not reliable"
//signal from HC-12 (433 MHz band). This is NOT "flexible" routine, and it is made so far only for 9600 bps. //So, for now, please use it "as-is". detachInterrupt(0); //very important to forbid triggering interrupt inisde interrupt!!! //two adjacent packets, instead reading just one packed as planned. //note: leave debug pulses as is, LED at pin 13 will rapidly blink. If not blinking... check for connections. No! All of that require more work. Especially for remote purposes. Also, my old projects on Arduino altimeter and other suffer from some intrinsic bugs related to “SoftwareSerial” and “VirtualWire” libraries. Now, I am using this library just to set HC-12, but soon it will be changed so that no any library will be needed. So far, it looks like it has double system, which is true: “mySerial” sending data to module, receiving message, and then in second part with manual codes dealing with “time critical” pulses. This part is not used in my altimeter project, and there are many bugs for this reason. Now, ISR part of the receiver take care of proper synchronization of incoming data and fill array exactly as it should be, instead random “mess”, and other weirdness with classical SoftwareSerial protocol(s). Soon (not sure how soon exactly), all my old project will be re-viewed and repaired, but I need lot of work on it. HC-12 module uses GFSK modulation, which is excellent – it is just enough wide as it should be, while for example ASK (A.K.A. OOK) modulation can spread on whole 433 MHz band. For this reason you may find that almost all ASK modules has the same frequency of 433.920 MHz, which is center of allowed frequency range from 433.050 MHz up to 434.790 MHz (simple math: (433.050+434.790)/2=433.920 MHz). So, all that wide mess is within legal limits.